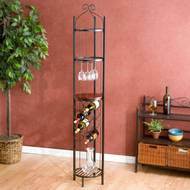 Elegant and beautiful, the SEI Celtic Wine Rotunda provides storage, display and organization all in one unit! This exquisite round wine tower is perfect for small spaces. Featuring storage for 8 wine bottles, a set of glasses and more! The two upper and one bottom shelves are metal grate while the counter is a wooden tabletop perfect for serving. Perfect addition for a kitchen, dining room or living room.